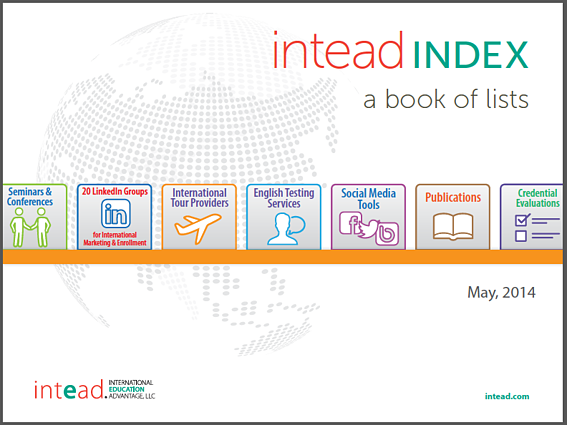 The Intead Index - Book of Lists Has Arrived! Hot off the digital presses: It's the Intead Index: Book of Lists. Our expert researchers have gathered the information we wish we had when we were working in admissions offices. We've spent time evaluating, comparing and then compiling the results. We do this to help you make informed decisions as you scale your international student enrollment. All of these, and more. We are comparing the tools used by some of the most successful institutions. We've gathered information from many sources including administrators who have traveled this path and expanded their international student populations by 100% or more. There's a whole lot to know when you work in the field of international higher education. Whether you work as an admission counselor, marketer, or high level administrator, you are required to stay current, globally. Conferences are a great source of the latest information. Why not download our Intead Index: International Education Enrollment Conferences and see how they stack up against each other? Here at Intead our goal is to make your professional life easier. We've done the research and compiled it into neatly organized indices of information. Download them. Share them. Even Tweet them if you'd like. Use them as justification to support your decision making within your institution. We stand behind our work and welcome your input to make it even better. Let us know if any of our indices are missing an organization or vendor you think should be included. With that in mind, please know that we are always looking for new topics, service areas, vendors, and digital tools to evaluate. If you have ideas for a new Intead Index, please let us know. Our researchers are eager to dive in. And soon, you will have the decision making information at your fingertips. Our field is dynamic and changing as fast as the global social media tools used by our target generation. Our Intead Index is dynamic as well. We will improve with your participation and suggestions. Here's to being in the know.